Jessica picked Check Yes Juliet by We The Kings, while Rosie went for Wes Anderson by Alex Lahey. Rosie is busy sewing pyjamas! She is using the Carolyn pattern from Closet Case patterns and Grainline Studio’s Lakeside Pyjamas. 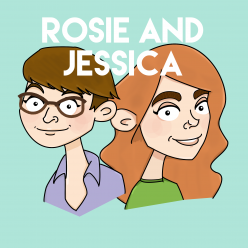 Rosie guest-edited Two Bossy Dames last week with beloved Dame Sophie, wherein they discussed living with chronic illnesses. Food banks are CLOSING and EMPTY right now. to feed someone in need. If you can't afford to donate right now, a RETWEET is free. I was a food bank user for months. Your time/retweets/donations literally do save lives. Thankyou. Watching Angela Clayton sew is the perfect accompaniment to sewing itself! For more cooking tips like “Will It Waffle?”, listen to The Kitchen Cabinet on Radio 4.